(In 1985, a 24-year-old man named Eugene D. Burt attacked several works hanging in the main concourse area of a Washington DC government office complex. 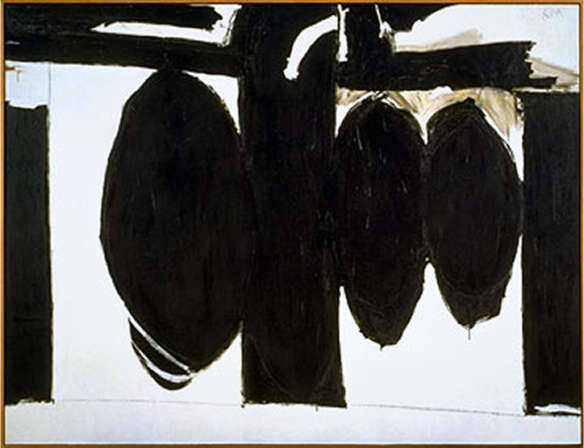 The damaged works were part of an exhibition that included artists Helen Frankenthaler, Robert Motherwell, Philip Guston, and Joan Mitchell. Burt, owner of a nearby shoeshine stand, walked into the concourse, pulled out a kitchen knife and slashed 8 of the 75 paintings. Then, with a red crayon, he wrote various religious slogans onto the paintings, some of which read, “John Paul is Good” and “Antichrist Ronald Reagan 666.” Seven of the eight works in question were destroyed beyond repair.